A socialization opportunity for the 55+ members of our congregation. Members enjoy lunch and a program at the monthly gathering. Book Club gathers once a month to discuss a chosen book(s). Men’s Bible Study meets the first Thursday of the month for breakfast and bible study. A bible study for women that meets the first Monday of the month in the evening for bible. Gloria Dei hosts a party for the community during the summer. Food, beverages, games and activities are all offered at no charge. Members are invited to socializing after worship in the narthex. Held on Easter morning before worship in Schroeder Hall. Held the Sunday before Lent begins in Schroeder Hall. Pancakes are served up hot and accompanied by a variety of delicious add-ons. This event also features a large raffle. Gloria Dei marches in the Menomonee Falls Memorial Day and Independence Day parade in an effort to reach out to the community. Women’s Christmas luncheon held in Schroeder Hall. Women’s Spring Tea held in Schroeder Hall. The Serenitas Prayer Garden is a labyrinth, based on an ancient walking pattern for contemplation and prayer located on the west side of our parking lot. This place of prayer and meditation is open to the public. 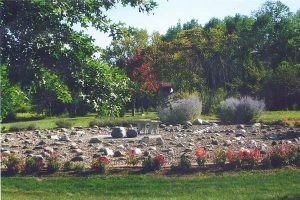 The labyrinth is built on a decorative stone base with walking lanes marked by assorted rocks and is surrounded by beautiful prairie plants, resting benches and stones inscribed with inspirational messages. Adjacent to the Serenitas Garden is a Memorial Garden surrounded by memorial trees and plantings. This library serves both the church and the community in the enlightenment and discovery of the different aspects of the Christian life, through hard and soft covered books, reference books, records, taped recordings and film strips. 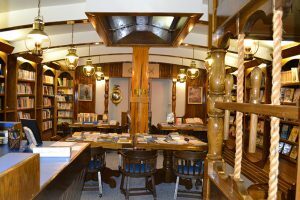 The library itself offers a delightfully unique nautical atmosphere, designed to create a comfortable learning experience.The Donald Hignite Memorial Library was built in loving memory of former church member Donald by the Hignite family. The library is open to the public during Church Office hours. Books are available for check-out. Contact the Church office at 262.251.7720 with questions. Donald Walter Hignite was born June 14, 1957, son of Walter and Bette. The oldest of four sons, Don’s main interests were his friends and family, sailing the family boat, and his many studies. Don was an honor student throughout school and graduated Sussex-Hamilton High School to attend his freshman year at UW Madison. In 1976, while working his first summer for his father’s construction firm, two tons of metal casing accidentally let loose from a crane, landing on Don and resulting in his untimely death. For Don’s natural inquisitiveness for knowledge along with his love of the water, it was decided to build a library at the church that Don had attended for six years. May Don’s love of fun and knowledge live on in the Donald Hignite Memorial Library. The project was undertaken shortly after Don’s death on July 22, 1976. With Gloria Dei’s blessings, the planning began and ground was broken. Book selection and policy committees were set into motion and through the aid of donation events, new books were purchased and cataloged. The nautical motif was a natural because of Donald’s love of sailing. Among the many appointments, the library includes 16-inch actual solid brass portholes from a ship salvage in Texas, custom-designed and built door manufactured by a local millwork, curved planked walls with brass bolts, arched beam ceilings with 8’foot simulated skylight, solid 9-foot butternut log serving as the ship’s mast, and a custom brass sculpture of the Christian fish symbol hanging appropriately over the main archway. Each piece of furniture, cabinetry, or woodwork was designed, chosen, or built especially for the library with careful attention to beauty and functionality. The Donald Hignite Memorial Library was decided on August 3, 1980 as a living memorial to the glory of God.